Did you know you can use your Safeway Gas Reward Points at participating Chevron & Texaco Locations...Win a $50 Safeway Gift Card and try it yourself! If you shop at Safeway I'm sure you've seen gas rewards on your receipt, when you buy groceries you earn reward points and when you reach 100 reward points you get a $ .10 discount per gallon the next time you fuel up at Safeway. Here's my latest receipt, I've been saving mine so I have 3 which equals a $ .30 discount per gallon the next time I get gas. A $ .30 per gallon discount on gas totally rocks but I don't live super close to a Safeway fuel station, I have to drive a little bit out of my way to get to one so I was pleasantly surprised when I found out there is a new way to save on fuel, you can use your reward points at participating Chevron and Texaco locations. I do have a Chevron station that I pass going to and from my house which works out great because I am literally so cheap that I would let my points expire if I didn't happen to be driving past a Safeway fuel station at some point during the month to get gas. I tried it and it's super easy, you don't need your Safeway Card, it just asks you if you are a Safeway Club member and if you are you just enter your phone number and it tells you what your discount is. I had three so I had a $ .30 discount, easy peasy! It's simple to earn points, $1 spent on groceries equals 1 Point, same for prescriptions and right now every $1 spent on qualifying Gift Cards equals 4 Points, you could buy Safeway Gift Cards for yourself, use them like cash and earn 4X points. Safeway wanted me to try this out and let my readers know about my experience so they sent me a gift card and they also want to give a $50 Gift Card to one of my readers. WOOO HOOO so you can win a $50 Gift Card to Safeway just for leaving a comment below. Just tell me how much you would love to win a $50 Gift Card or what you would spend it on. One entry per person, feel free to share with friends and neighbors. Good Luck! P.S. Make sure I can reply back to your comment, or if you comment as anonymous at least leave a first name so I when I announce the winner you'll know it's you. Printable coupons for Baby & Toddler items including Diapers! Some good coupons for baby & toddler items, just click on the coupon to print. $1.50 off Little Swimmers...that's a good one! Sign up and get 3 FREE (real not digital) issues of Ladies Home Journal, you don't have to use your credit card and they won't send you a bill later. Tons of FREE Activities at Maple Valley Kids Festival this weekend! 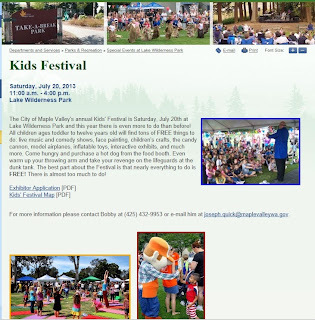 Lots of stuff going on this weekend, if you are looking for something free or cheap to do with your kids head to Lake Wilderness Park in Maple Valley, Saturday July 20, 11-4. Almost everything is FREE, bouncies, face painting, activities, crafts, you can purchase food and drinks. Go here for more details Maple Valley Kids Festival. Simplest Sangria Recipe in the world! There are a million recipes for Sangria and many different ingredients you can use, the process can take days......I don't have days and all I have is wine, 7up and fruit so here you go! Red wine, yes I know it's in a box but I swear to you the Black Box Cabernet is really good. 7up, Sprite, Ginger Ale, whatever you have. Fruit...strawberries, peaches, oranges, blueberries, watermelon, whatever you have. Serve over ice, Voila' Simple Sangria!! If you're thinking about eating out tonight, but don't know where to go, this coupon might help you make up your mind. Print this $5 off 2 entrees coupon for the Olive Garden. I love the salad and breadsticks at the Olive Garden!!!! Nothing better on fresh summer berries than Homemade Whipped Cream, just say NO to the fake stuff! I know it's easy and cheap to buy the tubs of "whipped cream" but you can make your own homemade whipped cream in the same time that it takes those tubs to thaw out, I don't know about you but that fake stuff leaves a greasy weird taste in my mouth. When you make your own you know exactly what's in it and it tastes 100 times better!!! Don't be scared, if I can do it than you can do it. You will need 1 cup heavy whipping cream, any brand, organic, whatever you want, 2 Tablespoons Sugar (don't freak out, you can omit the sugar if you want) and 1/2 teaspoon vanilla. Try to chill the bowl you are mixing it in ahead of time, if you can't no big deal, use a hand mixer or your stand-up mixer on medium and beat it until it gets fluffy. That's all there is to it, use right away or cover with plastic wrap and put in the fridge. See I told you, easy peasy right? This pint cost me $2.39, I only used 1 cup out of it so I have enough to make another smaller batch so not expensive to make at all!!! Have you ever wanted to try Botox? (I can think of a few places I wouldn't mind trying Botox) Or maybe you were thinking about getting your eyelashes done? 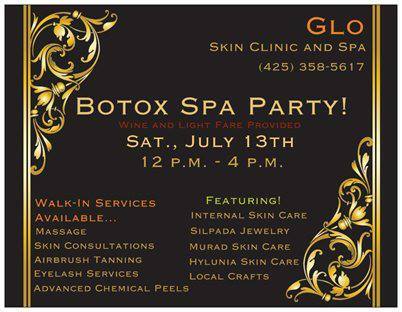 This weekend is the perfect opportunity to try either of these or maybe a Massage or Airbrush Tanning, GLO Skin Clinic And Spa in Maple Valley is having a Botox Spa Party, Saturday July 13 from 12-4. Enjoy some wine and snacks while you look at local crafts and jewelry, indulge yourself and get a massage or have a skin consultation. Lots of giveaways going on too, the first 5 Botox Clients get a Gift Certificate for a FREE Facial, you can win Murad and Hylunia skin care products even 3 month passes to Tahoma Athletic Club. Super fun and a totally relaxed atmosphere, bring some friends and make a day of it! Did you know that used Brita water filters can be recycled? I just found out and wanted to share: You can recycle your used Brita water filters. Check out Recycle your Filter for all the details. Whole Foods is a drop off location but not all Whole Foods so check the list, I was really surprised that Whole Foods in Washington State (my state) is not accepting Brita Filters? I'm really curious why, we are super crunchy here in the Pacific NW and we recycle everything that doesn't move so that was kind of a shocker. You can also mail in your used Brita filters (at your own expense), get the scoop at Recycle your Filter. Make "Mom Cards" for playdates and meeting other Mom's, you can get 250 for FREE. There are times when you need to quickly give someone your contact info, you may not always have time to enter it into your phone or maybe they don't have a smart phone (we just got smart phones and started texting last summer). I ordered these free business cards from Vistaprint, I made mine into "Mom Cards", just my name and my contact info so when I'm at the park and meet other Mom's or for example I joined the PTA last year and at one of the meetings I just handed out a bunch of my cards so that everyone had my contact info, some people were so impressed that I had cards. They are super easy to order, you just choose a design that you like, they have tons of cute designs, fill in the blanks with as little or as much contact info as you want, the cards are totally Free, just pay a few dollars shipping depending on where you live. I've ordered from Vistaprint at least a dozen times and have always been really happy with my orders, you can even pay with your PayPal account if you don't like using your credit card online. Save $10 or more at Shoe Carnival, in-store or online! Through 7/7, take $10 off every $50 purchase up to $40 off $200 at Shoe Carnival, in-store or online. Click to print, show printed coupon at checkout! If you are 65 or older and you shop RiteAid this is a great money saving program to sign up for, every first Wednesday of the month Seniors get 20% off all non prescription purchases all day plus lots of other exclusive deals. If you already have a RiteAid card you can just login to your account and activate Wellness65+.